February Gardening Tip: It's Haircut Time! Spring is right around the corner, and with rising temperatures will come an abundance of beautiful new growth. Many grasses and perennials in Central Park Gardens grow actively during the warm season, but die back in the winter. Although still perfectly alive and healthy, these plants can look a bit bedraggled and half-dead right now. 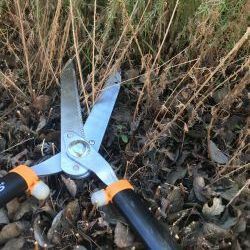 Enter the pruning shears! Shearing back last year's growth in January and February makes way for the fresh new growth of spring. The plants that get this special shearing treatment are the winter-dormant grasses and herbaceous (soft-stemmed) perennials. Examples of perennials that fall into this category are California fuchsia (Epilobium canum), goldenrods (Solidago), catmints (Nepeta) and asters. Since their growing points are protected underground, they can be mowed to as low as one or two inches tall. Grass examples are eyelash grass (Bouteloua gracilis), miscanthus (Miscanthus sinensis), and fountain grasses (Pennisetum). Generally, it's better to cut grasses a bit higher to three or four inches high. If part of your garden looks pretty bare after doing this "big chop", those are places to consider planting winter bulbs, such as daffodils this fall. The daffodils will provide winter greenery and color next year to help fill the gaps between winter dormant plants. Daphne is the star of the winter garden show in Central Park Gardens. Over the course of December and January the anticipation builds as purple buds begin to form at the tip of every stem. In late January the flowers open to reveal white petals and release one of the most rich and delicious perfumes the garden has to offer. If temperatures stay cool, the flowers will last well through February, but as warm days come in March, they quickly fade and give way to the chorus of other spring flowers. 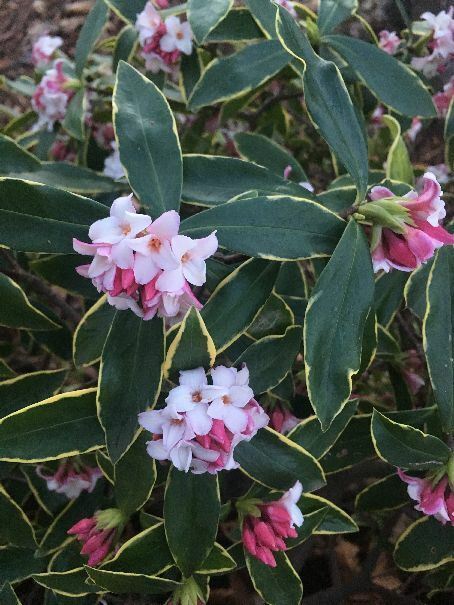 Daphne odora hails from China and Japan, and the cultivar ‘Aureomarginata’ is unique for the creamy yellow stripe that outlines the edge of each leaf. It’s a treasured plant for partial shade and is best planted near a path where the fragrance can be appreciated. The waxy evergreen leaves almost look too perfect to be real, and the plant has a naturally rounded shape that rarely needs pruning or trimming to look tidy. It grows to about three feet tall and four feet wide. Daphne’s only downfall is its sensitive root system that needs good drainage. Like a prima donna, it will quit without warning as it succumbs rapidly to root disease. The best ways to ensure daphne’s survival are to not disturb the roots when you initially plant it, put it in a location with afternoon shade in the summer, plant it a little high so it’s not sitting in a puddle in the winter, and water it no more than once a week in the summer. Overwatering is the easiest way to kill daphne growing in clay soils. Many an envious gardener has eyed the large, healthy daphne in Central Park Gardens on the north side of the Sensory Garden. What’s our secret to success with this plant? Shade from the nearby apple tree, a nice layer of mulch to protect the roots, and deep irrigation once every two weeks. Oh yeah, and the constant stream of children jumping nearby as they climb in and out of the apple tree! Are you interested in gardening? Do you enjoy meeting new people and volunteering in your community? If so, we hope you’ll join our Volunteer Garden Steward training program! We are seeking community members who can assist with the leadership of our 2-hour volunteer gardening sessions on Saturday mornings. With support from our experienced garden leaders, Garden Stewards will help guide small groups of volunteers in the care of Central Park Gardens. Our volunteers typically include many UC Davis students seeking volunteer service opportunities, UC Master Gardeners, and community members from a wide range of ages and backgrounds. The Garden Steward training program will be held from 9 am to 1pm on Saturdays, October 14, October 21, October 28, and November 4. Training will be led by experienced horticulturists and educators Anne Schellman and Emily Griswold. Hands-on gardening training topics include pruning, planting, weed identification and control, mulching, and perennial and grass care. Trainees will also learn background information about Central Park Gardens as well as leadership skills and tips for engaging volunteers in the garden. 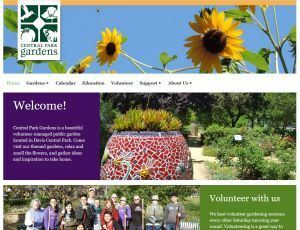 After the completion of the training, Garden Stewards are asked to commit to assisting with Saturday morning volunteer gardening sessions at least once a month for a year. 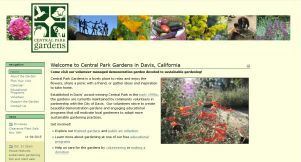 Central Park Gardens of Davis is a completely volunteer developed and run organization. Volunteers work to create our inspiring demonstration gardens and engaging educational programs. These community resources aim to motivate home gardeners in the region to adopt more sustainable gardening practices. Our dedicated volunteers come together to care for the gardens and in the process have lots of fun, meet like-minded people, learn more about gardening, and have the joy of contributing to a community treasure.